Looking For a Kelowna Home For Sale with a Pool? Nothing beats a cool dip on a hot summer's day; and luckily for those of us who call Kelowna home, the Okanagan is absolutely full of beautiful, sunny days that often begin in May and continue all the way through into September! The trip down to the lake or local pool, however, is not quite as pleasurable. In fact, some may even describe it as down right torturous. But, what if you didn't have to deal with the hot sticky seats of your vehicle, impatient vacationing traffic, sand in your shorts, or the damp, musty smelling towels left in your beach bag? What if, instead, you could simply trot downstairs, make yourself a refreshing beverage, slide your back door open, and splash into your very own pool? Imagine, laying by your pool side and catching some 'rays without any worry about who's around or what you look like? Summer lovin had the whole family a blast! Kids love to splash around, and during the summer months, they will often beg to be taken down to the pool, and who can blame them? Yet, time and time again, the pool proves only to be a breeding ground for germs, bacteria, and unwanted illness that can ruin your summer plans. If that wasn't enough, you have to deal with the endless yelling, and crowds and crowds of people that make it hard for you to keep a safe eye on your little ones. A pool in your backyard makes it easy for everyone to enjoy the summer. The kids can play, while you dip your feet in the edge, or read a book beneath the shady refuge of an umbrella or canopy. Sounds to good to be true? It isn't! If buying a home with a pool feels out of reach for you, and you don't know where to start, let us help you! Our dedicated team of professional real estate agents are determined to find you your dream home at your dream price! Just take a look at our most recent Kelowna homes for sale with pools, and you will see that we have a great selection of homes suited for any family or lifestyle! 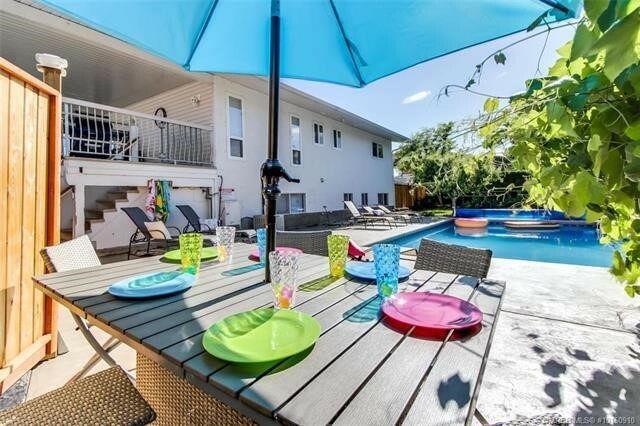 View More Amazing Kelowna Properties With Pools Here!